Tinie Tempah is ruling the Brish rap scene aer earning a whopping four nominaons for the upcoming Brit Awards. With his Nigerian roots, the rapper seems to be walking the path of the recent Brit R&B hit singer Lemar (Lemar Obika ) who’s of south eastern Nigeria background. Lemar has already achieved eight Brit Award nominaons winning two (Brish Urban Act of the Year award 2004 and 2006). In the past there have been British superstar singers who can trace their roots to Africa. Being a British colony, Nigeria seems to be much more linked with some of the finest British singers. Sade Adu (Helen Folasade Adu), who was born in Nigeria (of Nigerian father and English mother), achieved success as the front woman and lead vocalist of the popular British and Grammy Award winning English group ‘Sade’. English soul and R&B singer-songwriter Seal (Seal Henry Olusegun Olumide Adeola Samuel ) who’s known for his numerous international hits is of Nigerian background. Tunde Baiyewu, the baritone black vocalist of Lighthouse Family, a British musical duo that rose to prominence in the mid-1990s, is of Nigerian descent. Baiyewu was born in London but moved to Nigeria at the age of five after the death of his father. Ten years later he moved back to England. Tinie Tempah, was born Patrick Chukwuemeka Okogwu Jr. (7 November 1988) in London to Nigerian parents. He attended St. Paul’s Catholic School in Abbey Wood, London SE2, (now known as St. Paul’s Academy). He went on to study A Levels at St Francis Xavier Sixth Form College SW12. In 2006, Tinie gained a great deal of airplay on British music TV channel, Channel U, for his song ‘Wifey Riddim’ and then in late 2007, Tinie Tempah collaborated on a track with grime artists Agent X and Ultra. The song was titled “Perfect Girl”. Tinie also released “Tears” in 2008 which was taken from his début mix CD “Hood Economics”. He toured with Chipmunk in February 2009. He announced his signing to Parlophone in October 2009 by running a competition on his blog, with the winner invited to High Tea at Claridges to celebrate the deal. Tinie released his debut single “Pass Out” with Parlophone on 28th February 2010, with it entering the UK Singles Chart at number 1. Selling just over 92,000 copies, making this his first number 1 which it remained for two consecutive weeks. Tinie would later perform “Pass Out” on 25th June 2010 at Glastonbury on the Pyramid stage with Snoop Dogg. Tinie then announced his second single, “Frisky”, which was released on 6 June 2010 entering the UK Singles Chart at number 2. Tinie supported Rihanna for four dates (London on 11 May, Nottingham on 14 May, and Glasgow on 19 and 20 May.) on her 10-date UK tour with Tinchy Stryder and Pixie Lott. Tinie performed at many summer balls at various universities around the United Kingdom. Tinie performed at Radio 1 Big Weekend in Bangor on 22 May 2010 on the ‘In New Music We Trust’ stage. He also toured with Mr Hudson in May 2010. 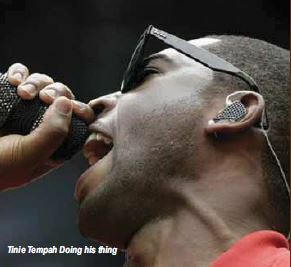 Tinie Tempah played the Summertime Ball at Wembley Stadium on 6th June 2010, at Wakestock in Abersoch on 3rd July 2010, both T4 On The Beach and the Wireless Festival in London’s Hyde Park on 4th July, and both days of the V Festival on 21 and 22 August 2010. 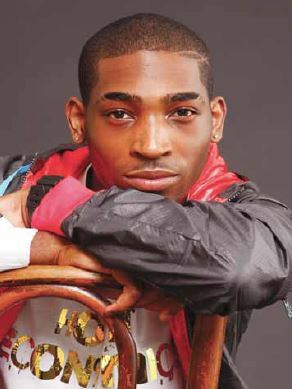 Tinie released his third single “Written in the Stars” on 19th September 2010. This again charted at number 1 in the UK Singles Chart selling over 115,000 copies in its first week, making it his biggest selling single to date. The song also went on to chart in a number of other countries. Tinie went on to team up with Swedish House Mafia for his fourth single “Miami 2 Ibiza” which was released on 1st October 2010. This went on to reach a peak of number 4 in the UK Singles Chart and his first number 1 in the Netherlands Mega Single Top 100 chart. He released his long awaited debut album, ‘Disc- Overy’ on 4th October 2010 which featured all his previous charted singles. On 11 October 2010 he kicked off his first UK tour which was supported by Chiddy Bang. He went on to win his first 2 MOBO Awards in October. He went on to feature on the Tinchy Stryder single “Game Over”which was released on 15th November 2010. This reached number 22 on the UK Singles Chart.Tinie released his fifth single “Invincible”on 25th December 2010, taken from his album ‘Disc-Overy.’ It peaked at number 11 on the UK Singles Chart making it his lowest charting single release from the ‘Disc-Overy’ to date.